Have you ever gone into an experience expecting it to be a certain way? But once you got there it turned about to be different than what you anticipated? That’s how my first month with the Institute of Integrated Nutrition went. I enrolled in IIN® to further my education so that in turn, I could help others. But four weeks in and I’m realizing that its all about helping me. One of the core principles of the school is a concept called “primary foods.” But its not food. While many people have issues with food, when they peel back the layers, the root cause of their problem is not food. Its often an imbalance to one (or more) of the primary foods. When our primary food are in balance, so are we. When they are not in sync, problems in other areas may arise, and many people (me included) cope with food in some way - how ever that “way” may be. One of our first assignments was to rate ourselves in each of the primary foods. As difficult as it was to admit, I was (am) not balanced and had (have) glaring deficiencies in some areas. So in the spirit being vulnerable I have been working on balancing the areas that are lacking. And its hard. Like really hard. Its challenging to acknowledge my deficiencies. I've had to swallow my pride to mend relationships. And learn to forgive and let go of grudges. And look past the faults of others, accepting who they are. Yet at the same time, not compromising my own values. While it isn't easy, I can already feel my quality of life improving. 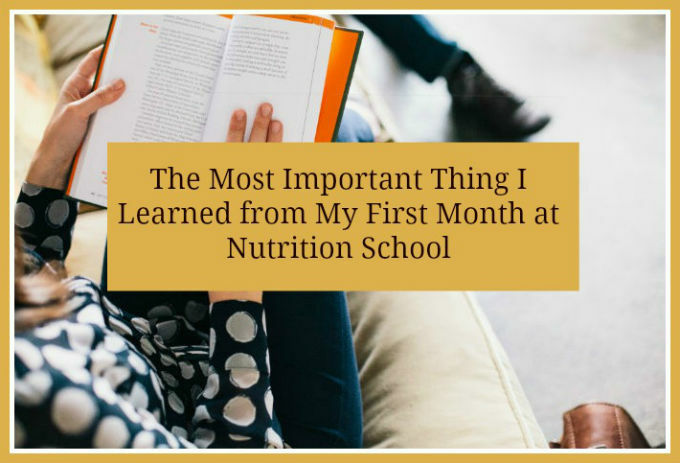 I knew that my year with nutrition school would be interesting. I knew that my passions would ignited and my knowledge expanded. What I didn’t know was how much personal growth I would feel just one month in! I didn’t know how deeply I would feel what I’m learning or how much my soul would feel fed. But its a liberating process and can hardly wait to see what else is in store! Tell me, how would you rate yourself in each primary food area?